Matt Doherty celebrates a goal. WOLVES BEAT SHREWSBURY 3-2 in the FA Cup tonight to reach the fifth round. 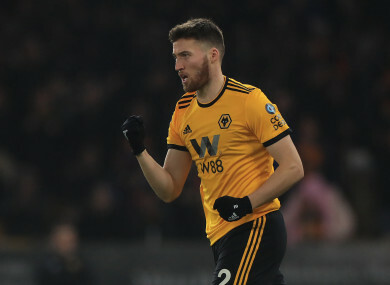 The Premier League side were inspired by an influential display from Irish international Matt Doherty, who registered two goals and an assist. After Doherty’s opener, goals from James Bolton and Josh Laurent put the League One side ahead. However, the Dubliner scored again in first-half stoppage time before providing the assist for Ivan Cavaleiro’s winner. Nuno Espírito Santo’s side now face Championship outfit Bristol City in the next round. Elsewhere tonight, QPR beat Portsmouth 2-0, with Matt Smith and Nahki Wells getting the goals. Ireland U21 international Ryan Manning made an appearance off the bench for the Championship side. Finally, Brentford beat non-league outfit Barnet 3-1. Sergi Canos, Julian Jeanvier and Neal Maupay were on target amid a comfortable win for the hosts, with David Tutonda grabbing a late consolation. Former Cork and Limerick winger Chiedozie Ogbene came off the bench for the Bees. Email “Two goals and an assist from Matt Doherty spares Wolves' blushes in FA Cup”. Feedback on “Two goals and an assist from Matt Doherty spares Wolves' blushes in FA Cup”.